We are hiring itinerant teachers of the deaf to work on-site with students in their mainstream schools, as well as provide service remotely through telepractice. Join Clarke’s community of cutting edge professionals in an advancing field, while also becoming part of our 150-year legacy of excellence as the oldest oral deaf school in the nation. If interested, please complete and submit the form on this page. To see the positions we currently have open, please go to clarkeschools.org/employment. Since its founding in 1867, Clarke Schools for Hearing and Speech (formerly Clarke School for the Deaf) has prepared children who are deaf or hard of hearing to succeed in mainstream schools and the wider world. In order to reach as many families as possible, Clarke now maintains five locations for classrooms and on-site services in Boston, Jacksonville, New York City, Northampton and Philadelphia; offers early intervention home visits; employs an itinerant staff of teachers of the deaf and hearing professionals and provides online consultations through telepractice. Clarke’s team of teachers serves students in preschool through high school in both mainstream school settings and via telepractice (video conferencing on tablets/computers). Services are provided as stipulated in a student’s IEP and can include consultation with professionals, direct service to students, support to families, program observations and staff training. In addition to the resources listed below, Clarke also holds an annual Mainstream Conference, and publishes a variety of educational products to help professionals and parents provide students with effective support and access in educational settings. 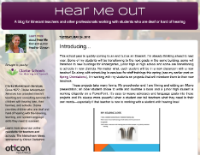 A blog for itinerant teachers and other professionals working with children who are deaf or hard of hearing. A resource for educators and families, the Mainstream Newsletter is published three times per year, in fall, winter and spring. Timely, practical articles help professionals and parents provide students with effective support and access in educational settings. Free to all interested parties, and designed to make information about LSL development for children who are deaf and hard of hearing accessible to all. Certificates of participation are available for all webinars and LSLS CEUs are available for select webinars. Informative brochure highlighting programs and services offered at Clarke Schools for Hearing and Speech. If you are certified to teach in more than one state, please indicate your primary state below, and use the Comments section to indicate additional states. What age of children have you worked with? If bilingual, what other language(s)? 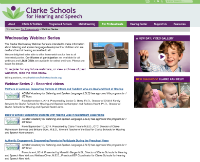 Clarke Schools for Hearing and Speech is an Equal Opportunity Employer.